Creating semiconductor structures for high-end optoelectronic devices just got easier, thanks to University of Illinois researchers. The team developed a method to chemically etch patterned arrays in the semiconductor gallium arsenide, used in solar cells, lasers, light emitting diodes (LEDs), field effect transistors (FETs), capacitors and sensors. Led by electrical and computer engineering professor Xiuling Li, the researchers describe their technique in the journal Nano Letters. A semiconductor's physical properties can vary depending on its structure, so semiconductor wafers are etched into structures that tune their electrical and optical properties and connectivity before they are assembled into chips. Semiconductors are commonly etched with two techniques: "Wet" etching uses a chemical solution to erode the semiconductor in all directions, while "dry" etching uses a directed beam of ions to bombard the surface, carving out a directed pattern. Such patterns are required for high-aspect-ratio nanostructures, or tiny shapes that have a large ratio of height to width. High-aspect-ratio structures are essential to many high-end optoelectronic device applications. While silicon is the most ubiquitous material in semiconductor devices, materials in the III-V (pronounced three-five) group are more efficient in optoelectronic applications, such as solar cells or lasers. Unfortunately, these materials can be difficult to dry etch, as the high-energy ion blasts damage the semiconductor's surface. III-V semiconductors are especially susceptible to damage. To address this problem, Li and her group turned to metal-assisted chemical etching (MacEtch), a wet-etching approach they had previously developed for silicon. Unlike other wet methods, MacEtch works in one direction, from the top down. It is faster and less expensive than many dry etch techniques, according to Li. Her group revisited the MacEtch technique, optimizing the chemical solution and reaction conditions for the III-V semiconductor gallium arsenide (GaAs). The process has two steps. 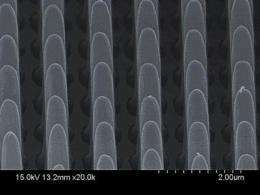 First, a thin film of metal is patterned on the GaAs surface. Then, the semiconductor with the metal pattern is immersed in the MacEtch chemical solution. The metal catalyzes the reaction so that only the areas touching metal are etched away, and high-aspect-ratio structures are formed as the metal sinks into the wafer. When the etching is done, the metal can be cleaned from the surface without damaging it. "It is a big deal to be able to etch GaAs this way," Li said. "The realization of high-aspect-ratio III-V nanostructure arrays by wet etching can potentially transform the fabrication of semiconductor lasers where surface grating is currently fabricated by dry etching, which is expensive and causes surface damage." To create metal film patterns on the GaAs surface, Li's team used a patterning technique pioneered by John Rogers, the Lee J. Flory-Founder Chair and a professor of materials science and engineering at the U. of I. Their research teams joined forces to optimize the method, called soft lithography, for chemical compatibility while protecting the GaAs surface. Soft lithography is applied to the whole semiconductor wafer, as opposed to small segments, creating patterns over large areas  without expensive optical equipment. "The combination of soft lithography and MacEtch make the perfect combination to produce large-area, high-aspect-ratio III-V nanostructures in a low-cost fashion," said Li, who is affiliated with the Micro and Nanotechnology Laboratory, the Frederick Seitz Materials Research Laboratory and the Beckman Institute for Advanced Science and Technology at the U. of I. Next, the researchers hope to further optimize conditions for GaAs etching and establish parameters for MacEtch of other III-V semiconductors. Then, they hope to demonstrate device fabrication, including distributed Bragg reflector lasers and photonic crystals. "MacEtch is a universal method as long as the right condition for deferential etching with and without metal can be found," Li said. That's clever. They use the metal like a catalyst in a what that only the catalysed area gets etched. Reminds me of how they built that neutrino detector in the ice in the arctic. But more importantly to me - Can this be used to help produce viable consumer memristors? IMO it's metal assisted corrosion similar to the contact corrosion which occurs at the phase interface of two different metals. For example, the zinc covered with mercury dissolves more slowly than the pure zinc, the zinc covered with copper dissolves faster (local electrochemical cells at the surface are catalyzing the reaction). The low intrinsic conductivity of semiconductors and the anisotropy of their conductivity makes the more process feasible at the atomic scale.